In 1978, PBS purchased four seasons of my most favorite television program ever: Doctor Who. A year later, I was born and was immediately immersed by my father into his admiration for science fiction. 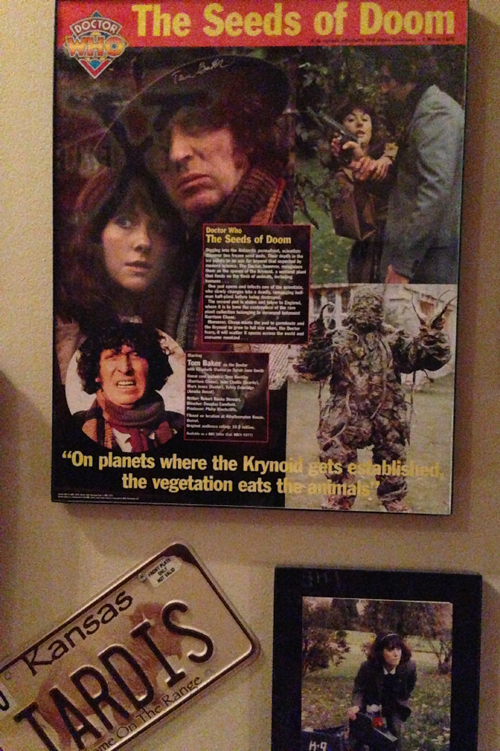 The first four seasons starring Tom Baker as the Fourth Doctor were exactly what had been sold to PBS. And this man with the grand voice and amazing scarf was my first Doctor and is still my favorite by far. Most people haven’t seen a lot of the old original Doctor Who. 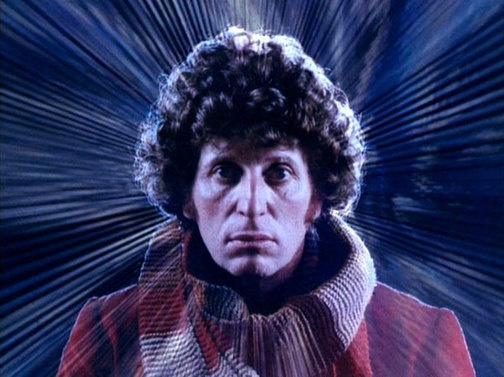 OK, a lot of you reading this probably have, but let’s face it — a lot of people have no clue who Tom Baker is. It’s a sad story, but it’s the truth. However, that immersion at such a young age again was one of those things that caused me to be who I am today. Despite watching Tom Baker as a kid, the next incarnation I skipped to was the Seventh Doctor, Sylvester McCoy. I’d watch Seven and Ace, on occasion, through their battles on a local station that happened to pick it up on Saturday afternoons. 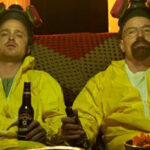 After that, well, it wasn’t until 2005 when the show returned that I became fully immersed once again. There is something about certain elements of Doctor Who that push beyond basic scifi entertainment that gets me emotional. 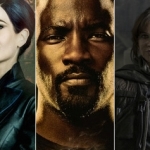 Don’t get me wrong, it is also a heavily flawed show as well — but when given the right emotional character balance, it can be amazing. Life lessons personified through monsters and aliens while loneliness and heartbreak is glazed over with sarcasm (which is an adjusted stress reaction) and occasional slapstick — wow. That’s perfection! While I could ramble for days with examples of this, I’ll give you just one. Even without knowing the context of this conversation between Ace and the Doctor, one can relate to the fact that we all have our own demons — be it minor or extreme. Doctor Who always finds a way to work this concept in. That’s probably why it is still here, 50 years later. 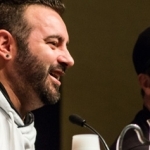 Yes, it has had its ups and downs — and yes, a LOT of downs, but it still is a huge part of pop culture and has been referenced time and time again. 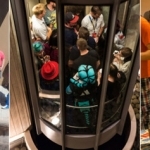 Doctor Who has become overly popular since the reboot and the amount of merchandise is insane. I had to stop collecting after a certain point. It ultimately became a game of pick and choose because of the sheer fact that I would go broke otherwise. There is no possible way to even include everything I own in this article. As you can see, I’ve thrown a few photos in above. This isn’t even a quarter of what I have in this house. There are countless more items — posters, toys, a 12-inch Matt Smith figure (Oh yes, he is my second favorite Doctor! 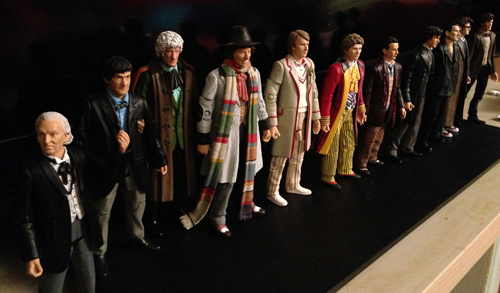 ), classic toys — I even have a Tom Baker t-shirt that I made. Quick story on that: in 2005 I got on stage at a Green Day concert and played guitar with them, wearing said Tom Baker shirt. Pretty awesome. 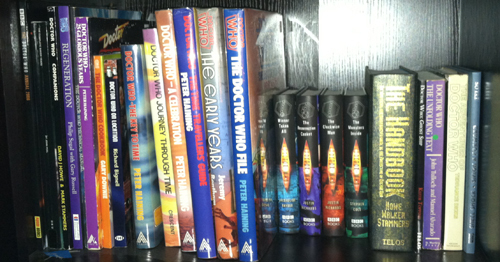 So, let’s go with some of the fundamental things that prove I love Doctor Who — and my favorite Doctor, Tom Baker. First things first. 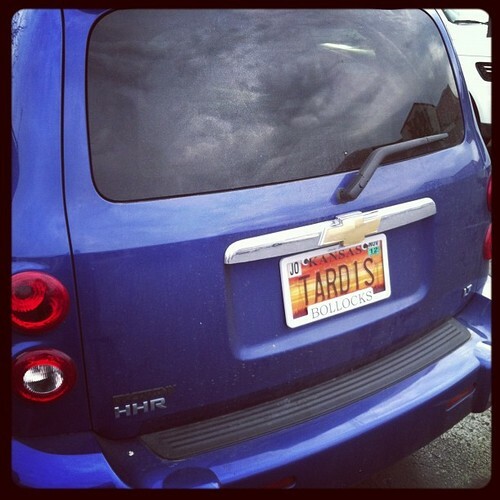 Who drives a TARDIS? I do. Yep, this lovely blue box of a car is mine. In 2005, I was driving a green Dodge Stratus — and even then, I had the license plate TARDIS (note, I had to change it to TARD1S two years ago. I was NOT amused.) But after that car fully died, I went out shopping for a new one and the second I saw this bad boy, I bought it. 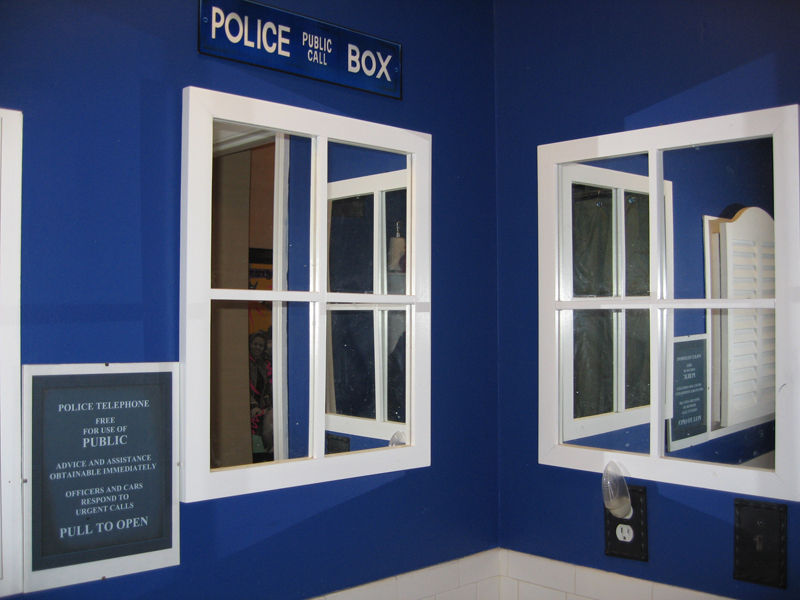 Second — who has a TARDIS bathroom? I do. Yep, when I bought my house the same year, I immediately painted the small bathroom “TARDIS blue” and threw up a couple of window mirrors and a police box sign. 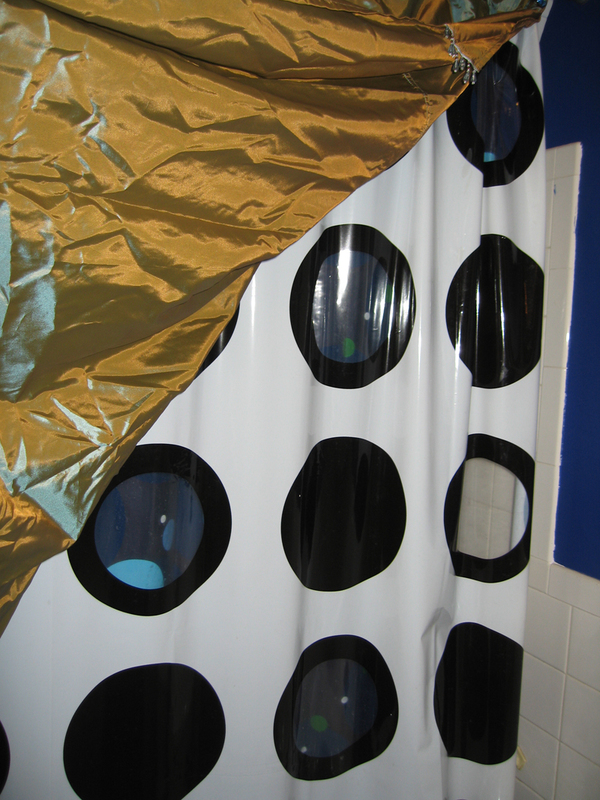 Even the shower curtains resemble the original TARDIS inside. Did I mention I adore Tom Baker? Yes, I have many Tom era articles in the house. Going up one side of my staircase is a collection of Tom posters, some signed, and cards. 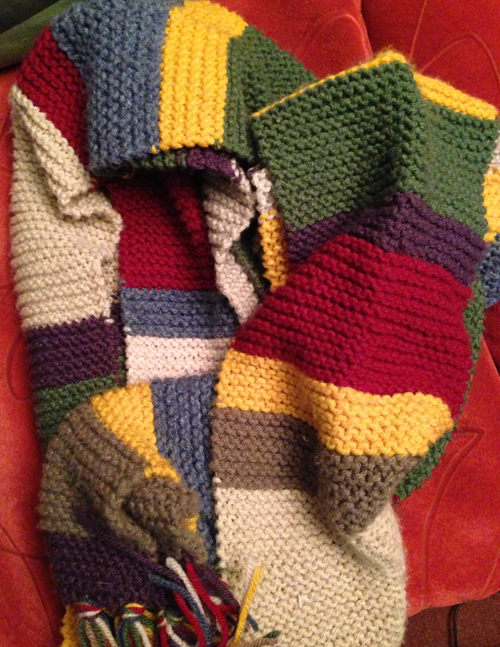 I also have a lovely Fourth Doctor scarf knitted with the same stitch and pattern as the original worn on the show. 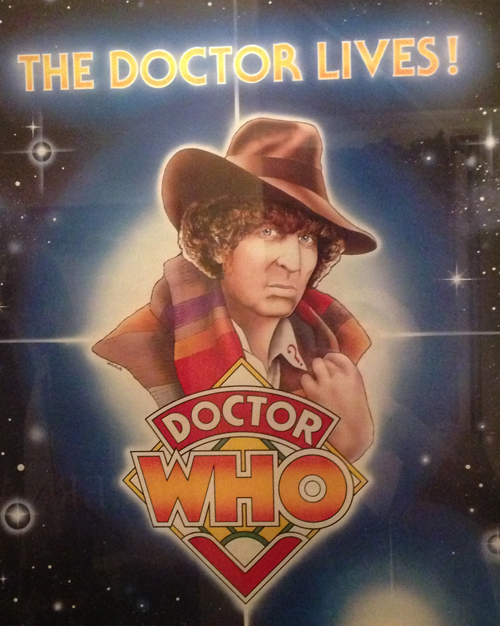 The greatest thing I’ve ever done is a Tom Baker tribute video which I’ve proudly hosted on YouTube since 2006. Set to “Toxic” by Britney Spears, the video features a handful of delectable Tom clips, which have been enjoyed by quite a few fans! While Doctor Who is viewed as a campy cheesefest by many people, there are a few of us that see its depth. There are a few of us that have admiration for those moments where it truly hits home with its emotions and we know exactly who the Doctor is. What colour and make of paint did you use for your bathroom? It’s lovely.